It's an LG L206WTQ-BF, manufactured January 2008. The symptoms are that when powering up (either from full shutdown or power-save mode) it takes a long time to start. The power light (which is solid orange in power-save mode, solid blue when fully turned on) goes blinking blue and the screen remains blank for about fifteen minutes. Then the logo appears as it would in a normal startup; sometimes the logo appears and disappears a couple times over the course of two or three seconds; and then the monitor works normally. This is a fairly well-known and well-understood failure mode with these kinds of monitors: it's almost certainly a bad electrolytic capacitor in the power supply. The critical part of this kind of capacitor is a very thin layer of aluminum oxide on the surface of a rolled-up piece of foil. The oxide layer is a little bit unstable; it is created and maintained by the interaction of the aluminum with a water-based caustic electrolyte solution. Over the course of a few years, and this is likely to happen sooner and more likely to happen at all if the capacitor was a cheap one, the electrolye can leak out or dry up. 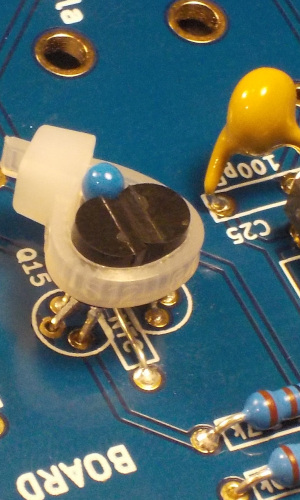 When that happens, the capacitor can still sort of function as long as the device is turned on, because the voltage across the capacitor helps maintain the oxide layer. But when it's turned off, the oxide starts to dissolve into what's left of the electrolyte, and so when you turn it on again, it doesn't work. The power supply starts producing some voltage, but it's not enough, or not stable enough, for the computer inside the monitor to start up. However, as it sits there trying, the supply voltage across the capacitor starts regenerating the oxide layer until eventually it reaches a usable condition. Then the voltage rises and stabilizes and the controller can start and then it's fine as long as it remains turned on. When it's turned off, the oxide starts to degrade and the cycle starts over again. This model explains some details like the fact that if it's only turned off a few minutes, then it can start again promptly, but the longer it's turned off the longer it will take to start the next time. So, I know what's wrong. The question is what to do about it. In the short term I guess I could just never power it down at all, but that's obviously not a good long-term solution. Given the cost of labour, in comparison to the value of a used monitor of this size and age, it seems unlikely I can hire someone to repair it for a price that makes sense. It goes against my grain to throw out a machine that still works except for a simple replaceable part. These considerations point toward the idea of fixing it myself. However, it's going to be a lot of work to disassemble it, and I have to do that before I can even look at the capacitors. Then the sensible thing to do is replace all the electrolytic capacitors in the power supply, because unless one is visibly leaking I'd have to unsolder them to test or precisely identify them anyway, it may not be possible to reliably determine which one is bad even with them unsoldered, and even if only one is bad, the fact that one went bad means the others are probably close. Then there's the question of where to get replacements. I've got a lot of miscellaneous electronic components lying around, but there's no guarantee I'll have a good match to the bad ones, and any matching spares I may have will themselves be years old (and likely salvaged from other things, not new). I don't want to go through putting in replacement capacitors that will just die again next year; the cost of my own labour, even though I don't pay money for it, makes that a bad proposition. All in all, it looks like what I have to is disassemble the monitor, unsolder all the electrolytic capacitors in the power supply, buy replacements for all of them mail-order (which entails a wait of a few days), install those, and put it back together. And I won't know for sure that I did it right, and that this really was the problem, and that this was the only problem, until the end of that whole process. So, that's what I guess I'll do. I am typing this on my laptop, logged in across the home LAN to my main desktop computer. The computer itself will remain functional unless something else goes wrong, but it looks like I have to do without a monitor for a few days. I'm going to post photos of my progress as I'm working on it, both because they'll be interesting and to help record where all the parts go for reassembly. Take the monitor to an org like "Komputers for kids." Either they'll fix it up and give it away or chop it up for parts and sell what's left by the kilo to a recycling plant. Or in the case of when I want to fix it myself, it's where I get used replacement parts fast and easy. They always have a box of something like capacitors for monitors. But they'd also have a box of complete circuit boards for . (They tend to have everything.) Checking with Google there is a "Computers for kids" in Winnipeg. No idea if it's the same charity franchise.